This blog post features No Match outfit at the new round of Designer Showcase from zOOm & Elle Boutique’s Wren Chokers at The Hipster Fair. ⚪ zOOm No Match Outfit at Designer Showcase until April 28. No Match Outfit with top, belts and pants/jeans, is only for Maitreya Bodies. Texture HUD included with 12 options for the pants, 3 options for the belts and 18 options for the top. You can buy No Match Outfit for 399L$ and there is a free demo to try. Inworld Location ‖‖ Facebook Page ‖‖ Blog ‖‖ Flickr ‖‖ Flickr Group ‖‖ Seraphim April Catalog. ⚪ Elle Boutique Wren Chokers at The Hipster Fair until April 13. Wren Chokers has three customizable chokers in linked or unlinked versions. Included are fitted chokers for Belleza, Maitreya and Slink plus an unrigged version, just touch it to resize. Included Texture HUD with options between 16 beads colors, 15 diamonds colors and 8 metal colors. SL Materials are enabled when turning the Advanced Lighting options on. You can get Wren for 209L$ and there is a free demo to try. Skin: Revoul by Ezekiel Revoul – Desire. Eyes: Oxydate by Oxydate – Intense. Lashes: Go&See by Kristyna Wikifoo – Lush. Eyeshadow: Pink Fuel by Mochi Milena – Hyper Glitz Winged. Ears: Pumec by Rita Pumec – St. Patrick’s Day. Hair: Aibeat by Aitang – Koboss. Tattoo: Speakeasy by Jamie Everleigh Moon – Shiver. Pose: FOXCITY by Satomi Masukami – Detached. Room Divider: Dust Bunny by Noel Bunny- Ivy. Shelf: Sway’s by Sway Dench – Jasper. Building: Anxiety by Joseph Domínguez & Michael Wright – %vialism. ● Body – Slink by Siddean Munro – Hourglass. ● Bento Head – Catwa by Catwa Clip (Jasim Abdullah) – Catya. ● Bento Hands – Slink by Siddean Munro – Dynamic Hands. ● Skin – Pumec by Rita Pumec (Otyebis) – Elle for Powder Pack Catwa July. ● Feet – Slink by Siddean Munro – High Feet. ● Eyes – Deetalez by Steffi Villota – Juanita Maria. ● Ears – Mandala by Kikunosuke Eel – Steking Ears Season 5. ● Lashes – Catwa by Catwa Clip (Jasim Abdullah) – Lashes Gift Hud. ● Eyeshadow – Kosmetik by Merredyth – Thick Cat Liner color for Catwa/Omega heads and comes with a hud of 12 colors @ Applique, open until August 7. ● Lipstick – Just Magnetized by Justyna Magne – Insta Beauty set 02 for Powder Pack Catwa July. ● Nails – Empire by Anna Grey – Coffin Nails Medium. ● Nail Polish – Dark Passions by Bcreative Wilde – Black Magic for Maitreya/Omega/Slink (can buy separately or a fatpack) to add a little bit of secret darkness to the look. 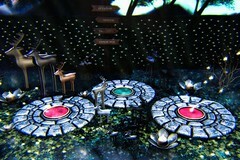 Each hud comes with 10 colors for hands and feet @ Darkness Chamber Fair, open until July 22. ● Outfit – Dafnis Clothes by Sandra Serin – Marialelena for Belleza/Slink/Maitreya and a texture hud of 20 colors/textures for top, 10 colors for the pants and 10 colors for the belt. ● Hair & Hairbase – Unorthodox by Tonio Harmison – Maddy Hair. ● Earrings – Supernatural by Sombria Baily – Asha Gold. ● Bracelet – Zoom by Lucca Millvale – To Love. ● Shoes – Slipper Originals by Elle Polygon – Belle Heels for Belleza/Maitreya/Slink hud controlled fatpack of 16 colors to change shoe straps/sole/insole/flower petals/metal @ The Chapter Four , open until July 31. This is a 2for1 sale and they come in 2 versions flat (previously blogged here) and this high heels version. ● Pose – HappyDispatch by Hiko Nino – F-01 stand. ● Photography tool – LUMIPro by Stefan Buscaylet.